You can gain an edge over your search engine competition by gathering data on their Web sites with a page analyzer. The page analyzer tool tells you what a Web page’s keywords are and computes their density (the number of times the keyword occurs compared to the total number of words in the page). When you run a competitor’s page through the page analyzer, it lets you analyze the on-page factors that help the Web page rank well in search engines. Subscribers to the SEOToolSet can simply run the Multi-Page Analyzer, but if you’re just using the free version of the page analyzer, you can follow this step-by-step process to build a comparison tool for yourself. In the spreadsheet program, open a new spreadsheet and call it Competitors. Type a heading for column A that says URL or something that makes sense to you. In this first column, you’re going to list your competitors’ Web pages, one per row. Under column A’s heading, type the URL (the Web page address, such as www.bruceclay.com) for each competing Web page (the pages that are ranking well in search results). You can just copy and paste the URLs individually from the search results page if that’s easier than typing them in. In the Page Analyzer section (the fourth tool down), enter a competitor’s URL in the URL to Check text box. Click the Check Keyword Densities button and wait while the report is prepared. The page analyzer report contains a lot of useful information (including ideas for keywords you might want to use on your own site), but what you’re trying to gather now are some basic counts of the competitor’s on-page content. So you want you to zero in on a row of data that’s about halfway down the report shown in the following figure, which displays a quick summary of some important page content counts. Meta Title: This count shows how many words are in the page’s Title tag (which is part of the HTML code that gets read by the search engines). Meta Description: Shows how many words are in the Description Meta tag (also part of the page’s HTML code). Meta Keywords: Shows how many words are in the Keywords Meta tag (ditto). Heads: Shows the number of headings in the text (using HTML Heading tags). Alt Codes: Shows the number of Alt attributes (descriptive text placed in the HTML for an image file) assigned to images on the page. Hyperlinks: Shows the number of links on the page. All Body Words: Shows the number of words in the page text that’s readable by humans. All Words: Shows the total number of words in the page content, including on-screen text plus HTML tags, navigation, and other text. 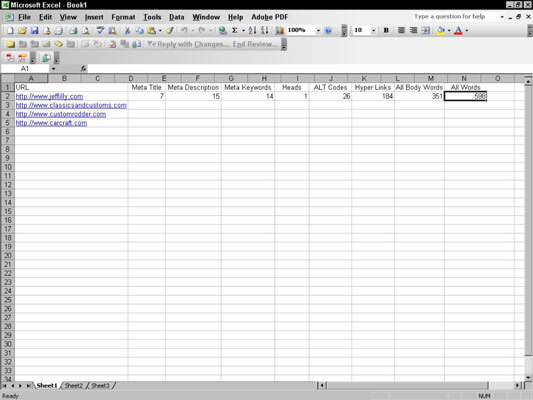 Now that you have the first several columns labeled, start typing in the counts from the report for this competitor. So far, your Excel spreadsheet should look similar to the following figure, which shows data from the first competitor filled in. Using a spreadsheet makes gathering competitor data easier. Next, run the page analyzer report for each of your other competitors’ URLs. You’re just gathering data at this point, so let yourself get into the rhythm of running the report, filling in the data, and then doing it all over again. After you’ve run the page analyzer for all of your competitors, you should have a spreadsheet that looks something like the following figure. After you’ve gathered some raw numbers, what can you do with them? You’re trying to find out what’s “normal” for the sites that are ranking well for your keyword. So far you’ve gathered data on eight different factors that are part of the search engines’ ranking systems. Now it’s just simple math to calculate an average for each factor. 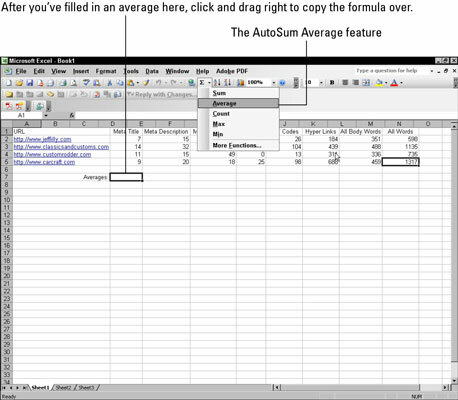 Excel makes this super-easy if you use the AutoSum feature in the toolbar. Click to highlight a cell below the column you want to average, click the triangle next to the AutoSum tool, and then select Average from the small menu that appears. When you select Average, Excel automatically selects the column of numbers above, so press Enter to approve the selection. Your average appears in the highlighted field. You can create an average for each of the remaining columns in literally one step. In the above figure, if you look at the black-outlined cell next to the word Averages, notice the slightly enlarged black square in the lower right-hand corner. Click and drag that little square to the right, all the way across all the columns that have data, and then let go. Averages should now display for each column because you just copied the AutoSum Average function across all the columns where you have data. Averaging the data from competitors’ Web pages lets you quickly compare your own Web site and see where you’re behind. 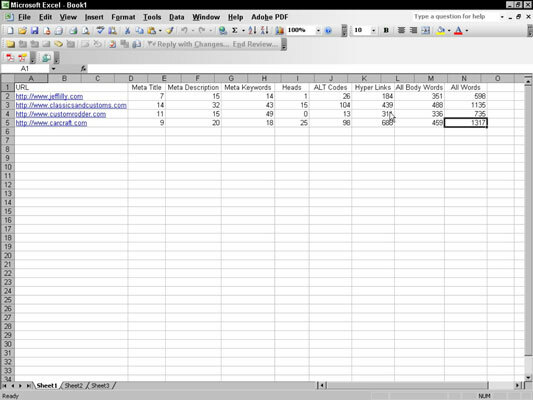 The above figure shows what your finished spreadsheet might look like, with the page analyzer data from all of your top competitors and an average for each of the eight ranking factors. You can next run a page analyzer on your own Web site and compare these averages to your own figures to see how far you’re off from your target. For now, just keep this spreadsheet handy and know that you’ve taken some good strides down the SEO path of information gathering.